It’s the dog days of summer and that means it’s hot outside! But that doesn’t mean that we can’t enjoy the outdoors with our dogs. In fact, for many of us, the summer is when we are able to spend more time with our dogs outside anyway. Many dogs will run themselves ragged with no thought about what the temperature is outside, simply because they’re having too much fun exploring. So it’s up to us to make sure they don’t overheat and make themselves sick. 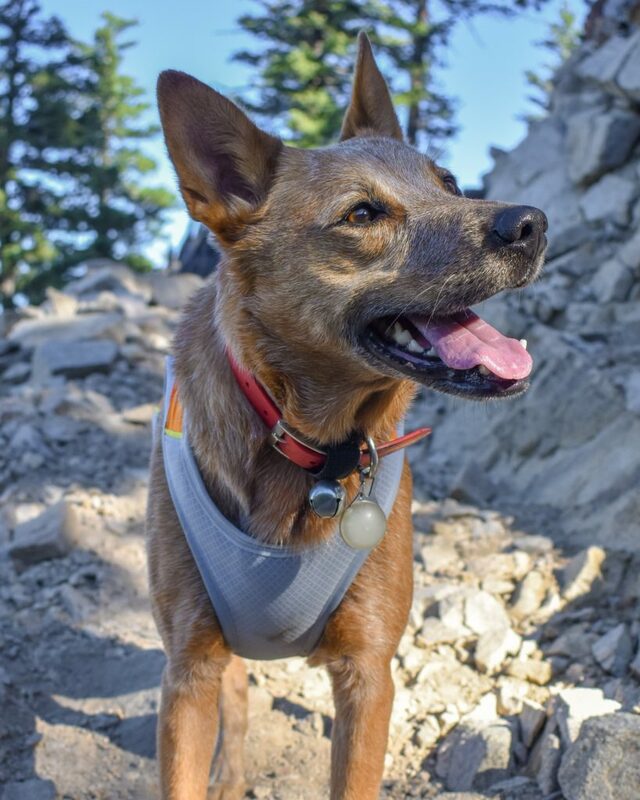 Enter the Ruffwear Jet Stream cooling vest. This self-described ‘fast and light’ cooling vest is just the thing to help keep your dog safe and happy in the hot summer temperatures. 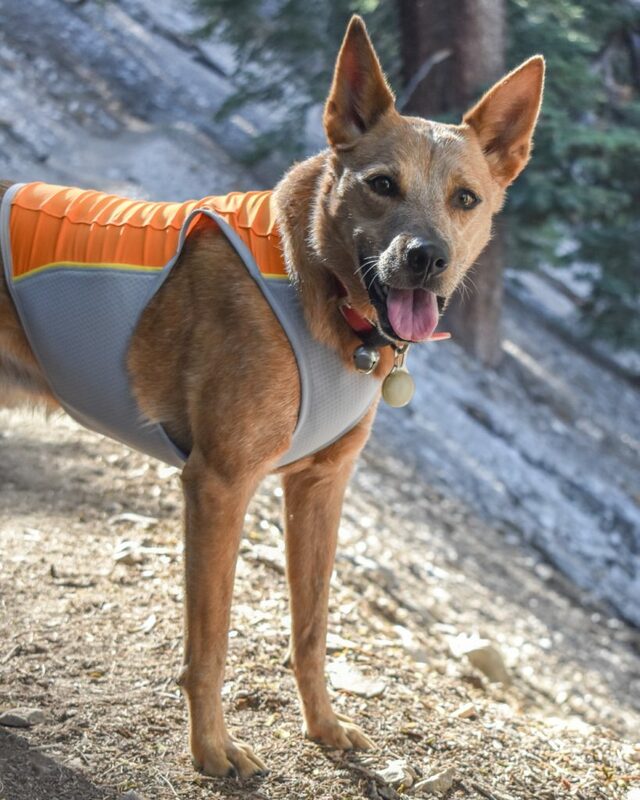 This is a lighter weight and more minimal version of Ruffwear’s Swamp Cooler cooling vest. Unlike the Swamp Cooler, the Jet Stream has no “leash portal,” aka a hole on the top/back of the dog to attach a leash to an underlying harness, which makes me assume it could be used underneath a harness if so desired. 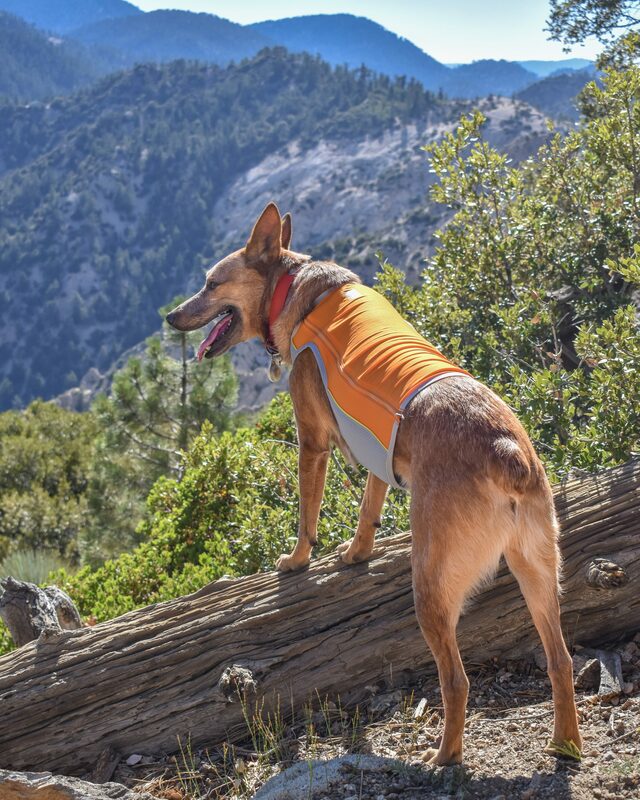 The Jet Stream is made with lightweight spandex with UPF 50+ that covers the dog’s back. 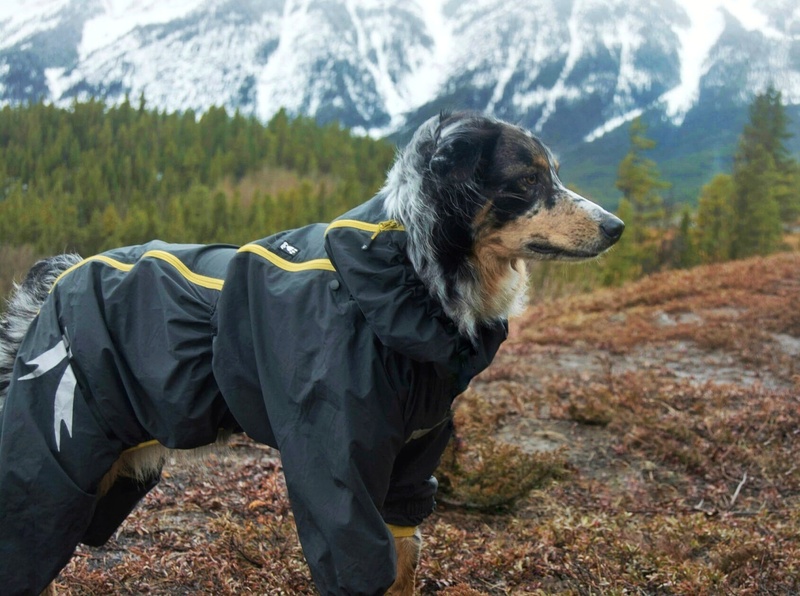 This is the first dog garment that I’ve used that has UPF in it like many outdoor clothing has for people. A UPF rating is the Ultraviolet Protection Factor a piece of clothing has. It it similar to a SPF rating for sunscreen. However, UPF blocks both UVA and UVB rays, where SPF only blocks UVB. Many different factors go into the rating of UPF – the fabric, the color, the weave – but suffice it to say, a UPF rating of 50+ is awesome, allowing only 1/50th (or 2%) of the UV rays to get through the fabric. 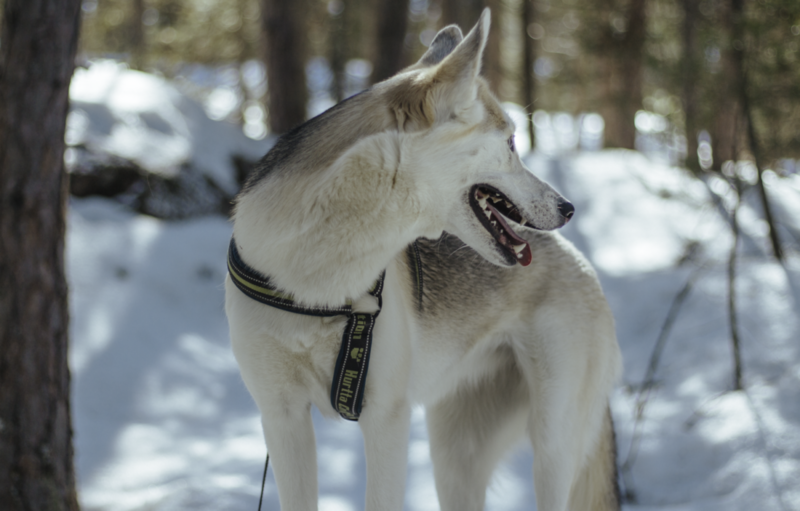 Since dogs have fur that covers most of their skin, their skin has very little melanin in it, meaning their skin does not absorb and dissipate UV radiation. So, having UPF in the Jet Stream would really be useful for short haired dogs and for darker haired dogs. The meat and potatoes of the vest though, is the three layer bottom section that covers the dog’s chest and part of their belly. There’s a wicking outer layer that reflects heat, an absorbent middle layer that stores water for evaporation, and an inner layer the transfers the cooling effect to the dog. Dogs have sweat glands on their paw pads, but do not have sweat glands distributed over their bodies like we do and instead pant to release heat and lower their body temperature. A water-soaked cooling vest on a dog mimics sweat on our skin. Water can hold heat without changing temperature and when it absorbs heat from another surface (the dog’s chest and belly in our case) it cools that surface. Once the water has absorbed enough heat it evaporates and takes that heat with it. That’s the basics of evaporative cooling. Dogs use their saliva (aka dog drool!) as evaporative cooling when panting, but why not help them cool off faster and better by allowing a larger surface of their body to cool via a cooling vest? 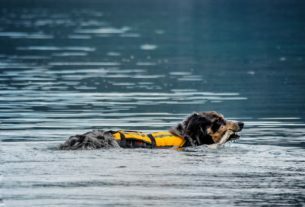 We’ve all seen dogs get into water, lie on cool grass, or dig a hole into some damp, cool dirt to cool off – the Jet Stream is a better looking and dare I say cleaner way of cooling your pup. Redford’s meant to be herding cattle in the Australian outback and subsequently does somewhat better in hotter temperatures than say, a Husky or a Malamute. He has shorter hair and a large tongue to aid his thermoregulation. In spite of these slight breed advantages, I’m still the one responsible for his safety and well-being when it’s hot outside. Doing Search and Rescue, we often don’t get to choose the weather in which we need to work. But working dog or not, a cooling vest could prove a vital piece of summer gear for any dog. We tested this vest on a day with temperatures in the low 80s. The inside tag of the vest has simple directions for use in picture form. From the pictures, it could seem like all you need to do is pour water onto the inside of the foam lower section, but I wanted the maximum cooling this vest could offer so I soaked the entire thing. 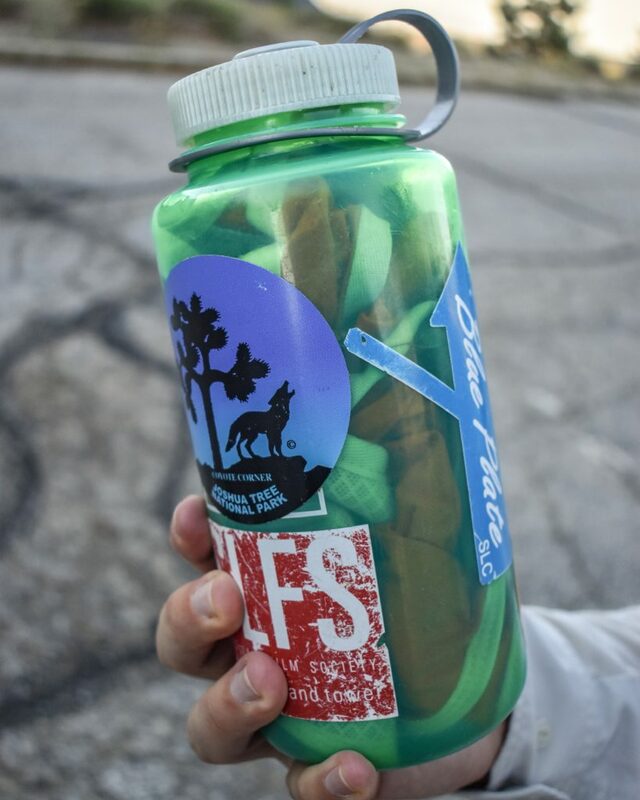 Redford’s vest (size Medium) fit just right into a 32oz Nalgene – every hiker should have one of those close at hand right?! I stuffed it in and then poured water into the bottle until it was full and let it soak. I took it out, barely rung it out, and put it on Redford. The top part of the vest (in our case the orange spandex portion) started to dry out after about an hour on, where the bottom (grey foam portion) started drying out after about 2 hours. I periodically put my hand between the bottom foam portion and Redford’s ribcage and it felt wet and cool. Redford was comfortable wearing it and it didn’t seem to affect his range of motion at all. If your dog is on the cusp of sizes, like Redford is – he has a 27 inch rib cage – you might want to consider going for the smaller size. The vest seemed to stretch out a little bit when wet and then did not seem completely tight around Redford’s belly. Some things to take into consideration would be if your dog is very fluffy or not. Redford has short hair and could have gotten away with the smaller size I think, although that may reduce the coverage of the bottom portion covering his chest and belly. 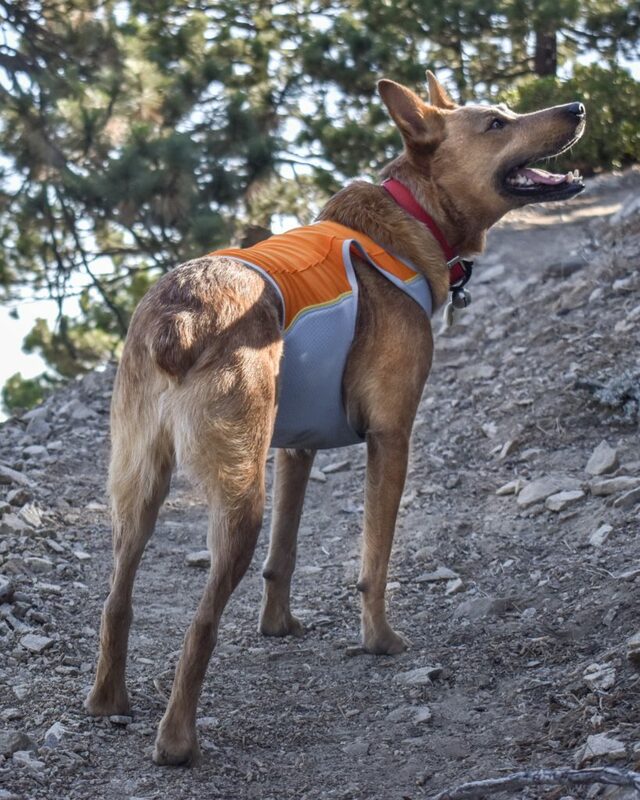 Having looked at some customer review photos on Ruffwear’s website, I noticed a similar fit issue I had with Redford, which is bunching in the arm hole on the top near the shoulders. 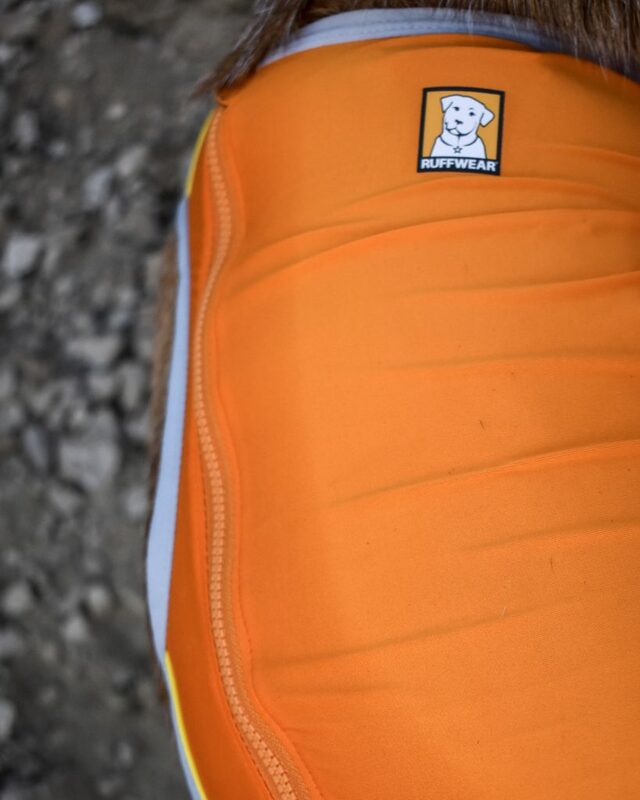 The hole is high cut and seems to be there for more range of motion for the dog’s shoulders, but because the spandex portion keeps the vest tightly hugging the body it slides up a bit with the dog’s movement. They could have made the top of the hole a little lower/smaller to combat this issue, but it’s more of an aesthetic problem than a functional one. There are really no cons with this vest, but if I had to name one it would be that it I would want it to come with its own stuff sack. It crammed so easily into my Nalgene for its pre-wear soak, it could easily fold into some type of pouch. We backpack quite often it would be great to have this neatly hanging on the outside of a pack for easy accessibility when needed. Overall the Jet Stream is a good investment if you think you’ll be out in hotter weather. But even with it on your dog, they still need to drink plenty of water and not over exert themselves, and you should be aware of the signs and symptoms of heat exhaustion and heat stroke. The Jet Stream seemed to keep Redford cooler than he would have been able to make himself by panting alone, although the only definitive way to test it would have been to measure his core body temperature with and without the vest while hiking in the same conditions, but alas I’m no scientist. The vest is also very easily hand cleaned with mild soap. Redford got some mud on his chest and seeing it on the new light grey I cringed thinking this vest was going to start looking haggard on the first use. But! I put some mild detergent on it and agitated it by hand in the sink when we got home and it came out looking like new, hats off to Ruffwear! We tried the vest in Salamander Orange, but it also comes in Blue Lagoon (an aqua/ turquoise color) and both seem like they could double as mild visibility vests. Overall, the Jet Stream delivered, is affordable, well made, and definitely worth a place in your gear closet. Very informative Cait. Thank you.